You were there, right? 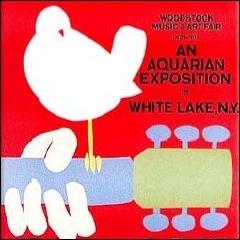 August 15-18 marks 40 years since the original Woodstock Music & Art Fair. Browse specials that are two minutes to two hours and include archival and new interviews, plus recordings from the festival. Producers include Joyride Media, Paul Ingles, Peter Bochan, and more. Musicians and audience members recall the festival that rocked the world. This two-hour special features interviews with Woodstock organizers, plus archival recordings from performers such as Jefferson Airplane, The Who, Richie Havens, and many more. From Woodstock to Altamont, Washington to Vietnam, Chappaquidick to Chicago with stops at Stonewall, Hyde Park, Shea Stadium, The Super Bowl, Memphis, Times Square, Sesame Street, and the Moon. Featuring commentary from John Lennon & Yoko Ono, Iggy Pop, the Smothers Brothers, The Firesign Theater, Monty Python, Richard Pryor, Mick Jagger, Keith Richards, Brian Jones, Roman Polanski, Richard Nixon, JFK, Buzz Aldren, Neil Armstrong, and more. Hyde Park, Shea Stadium, The Super Bowl, Memphis, Times Square, Sesame Street, and the Moon. Featuring commentary from John Lennon & Yoko Ono, Iggy Pop, the Smothers Brothers, The Firesign Theater, Monty Python, Richard Pryor, Mick Jagger, Keith Richards, Brian Jones, Roman Polanski, Richard Nixon, JFK, Buzz Aldren, Neil Armstrong, Walter Cronkite, Ted Kennedy, Burgess Meredith, Donald Sutherland, Elliot Gould, Dennis Hopper, Jack Nicholson, Peter Fonda, Dustin Hoffman, Michael Lang, "Topaz Caucasion", Chip Monck, Dave Marsh, Joe Boyd, Rob Kirkpatrick, Carl Capotorto, Arlo Guthrie, Hugh Romney, Harry Reasoner, Nile Rogers, various FBI and police agents, The Black Panthers, The Weather Underground, The Zodiac Killer, Apollo 11 astronauts and many others. Music from Hair, Midnight Cowboy, Sly and the Family Stone, The 5th Dimension, Elvis Presley, The Rolling Stones, James Brown, David Bowie, The Who, Les McCann & Eddie Harris, The Beatles, Bob Dylan, Blind Faith, Roy Budd, The Plastic Ono Band, The Jefferson Airplane, Arlo Guthrie, Canned Heat, The Beach Boys, Crosby, Stills, Nash & Young, Joni Mitchell, Beautiful People, Jimi Hendrix, Procol Harum, Henry Mancini and The Stooges! Folk artist Richie Havens is best known for his marathon performance at Woodstock. In this profile, hosted by David Dye, Richie Havens talks about his early influences and performing socially conscious music. Twenty modules in honor of Woodstock's 40th anniversary. Each piece includes a mix of live Woodstock music. Segments include exclusive and archival interviews with musicians and others involved with the original festival, including producers Michael Lang and Joel Rosenman, Richie Havens, Paul Kantner, Santana, Graham Nash, Eddie Kramer, and Rose Stone & Larry Graham from Sly & The Family Stone. Binnie and Anne, two college girls, start out on the road to become a part of history, but a child's worry about a parent's car unexpectedly changes all that. As we commemorate the 40th anniversary of the Woodstock Festival, there are many stories of those who went, those who never went, but what about those who, well "amost" made it? Binnie and Anne, 2 college girls, start out on the road to become a part of history, but a child's worry about a parent's car unexpectedly changes all that. Fred Migliore is joined by legendary NY radio personality, Pete Fornatale, whose new book "Back To The Garden" provides insight to Woodstock. Original interviews include Joe Cocker, Stephen Stills John Sebastian, Country Joe and Richie Havens. FM Odyssey has been going strong for 18 years and is heard weekly on 37 FM stations in the U.S. and abroad. Host/creator/producer Fred Migliore is pleased to announce the availability of another exciting FM Odyssey event, The Woodstock 40th Anniversary program. Featured will be the legendary New York radio personality, Pete Fornatale. His new book, "Back to the Garden", published by Simon and Schuster, provides incredible insight for this two-hour journey. The show will include original interview recollections from many of the headliners who appeared at Woodstock, such as Alvin Lee (10 Years After), Richie Havens, Joe Cocker, Country Joe McDonald, John Sebastian, Joan Baez, Leslie West, and Stephen Stills. The program also recounts the stories from the cast of characters who worked endlessly behind the scenes to put the concert together, and for those three days, overcame setback after setback to pull it off. There are highlights from an interview an interview Fred did with Duke Devlin, the site interpreter at the Bethel Woods Museum that sits on the original Woodstock site, and of course, plenty of great music. Sponsored by: The Museum at Bethel Woods Center for the Arts, NY, Yaktivate.com and Florida Institue of Technolgy..